Solar flares are tremendous explosions on the surface of the Sun. In a matter of just a few minutes they heat material to many millions of degrees and release as much energy as a billion megatons of TNT. They occur near sunspots, usually along the dividing line between areas of oppositely directed magnetic fields. They release energy in many forms – high intensity electro-magnetic radiation (Gamma rays, X-rays, UV), energetic particles (protons and electrons), and mass flows. The National Oceanic and Atmospheric Administration (NOAA) monitors the X-Ray flux from the Sun with detectors on some of its satellites. Observations for the last few days are available at NOAA's website. Flares are characterized by their brightness in X-rays (X-Ray flux in watts per square meter). Stellar flares and earthquakes show similar power-law distributions and both are ranked on a logarithmic scale with each class having a peak flux ten times greater than the preceding one. The biggest flares are X-Class flares. M-Class flares have a tenth the energy and C-Class flares have a tenth of the X-ray flux seen in M-Class flares. 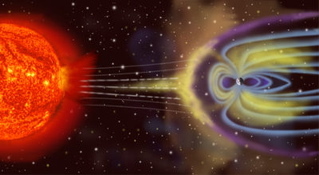 The more powerful M and X class flares are often associated with a variety of effects on the near-Earth space environment. On April 2nd, 2001, the most violent solar flare in recorded history short forth from the sun at an x+ level causing scientists to create a new measurement- the Y class! Solar flares were first observed on the Sun by Richard Christopher Carrington, and independently by Richard Hodgson in 1859, as small visible areas within a sunspot group. The frequency of occurrence of flares varies, from several per day when the Sun is particularly "active" to less than one each week when the Sun is "quiet". Large flares are less frequent than smaller ones. Solar activity varies with an 11-year cycle (the solar cycle). At the peak of the cycle there are typically more sunspots, and consequently more solar flares. Solar flares strongly influence the local space weather of the Earth. They produce streams of highly energetic particles in the solar wind and the Earth's magnetosphere that can present radiation hazards to spacecraft and astronauts. The soft X-ray flux of X class flares increases the ionization of the upper atmosphere, which can interfere with short-wave radio communication and can increase the drag on low orbiting satellites, leading to orbital decay. Energetic particles in the magnetosphere contribute to the aurora borealis and aurora australis. A solar flare on January 20, 2005 released the highest concentration of protons ever directly measured, taking only 15 minutes after observation to reach Earth, indicating a velocity of approximately one-half light speed. There is a hole in the ozone large enough to cover Antarctica. Concern about this hole lead to the international ban of CFC's and scientist have noticed that since the ban, the hole is closing at the rate of around 4% per year. However, volcanoes can also affect the size of the ozone hole too. The largest solar flare in the last 500 years may have shredded Earth's ozone layer to a greater extent than human-made chemicals have in recent decades, new research suggests, but the effect was only temporary, enabling the ozone levels to rebuild quickly after a few years. However, if such a flare occurred today, it would likely be even more damaging given the weakened ozone layer, and could lead to an increased rate of skin cancer around the world. On 1 September 1859, the Sun expelled huge quantities of high-energy protons in a 'superflare'. The event was seen on Earth by an observer who noticed a white spot on the Sun suddenly brighten for about five minutes. When the magnetic storm struck Earth, fires started in telegraph stations due to electrical arcing in the telegraph wires. The northern lights, or aurorae borealis, were reportedly seen as far south as Florida in the US. 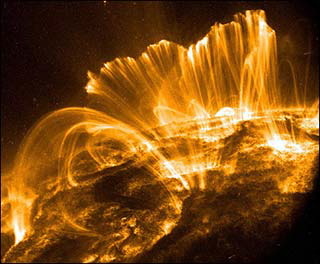 This flare released 6.5 times more energy than the largest solar flare of the satellite era, which occurred in 1989. That flare was strong enough to cause a power blackout in Quebec, Canada. Scientists have now calculated the ozone depletion from the 1859 solar flare for the first time by studying chemical deposits in Greenland ice cores. The deposits were laid down after the flare set off a series of reactions in Earth's atmosphere. For roughly two days after the flare, high-energy protons entered the atmosphere through the polar regions, channeled there by the planet's magnetic field lines. The protons ionized nitrogen and oxygen molecules in the atmosphere, which then formed nitrogen oxides. The nitrogen oxides in turn reacted with ozone - a molecule made up of three oxygen atoms, breaking it into oxygen molecules and atomic oxygen. This breakdown caused global atmospheric ozone levels to drop by 5%. In comparison, chlorofluorocarbons (CFCs) and other chemicals have depleted the levels by about 3% in recent years, says team member Adrian Melott, a physicist at the University of Kansas in Lawrence, US. However, unlike CFCs and other ozone-depleting chemicals, which can persist in the atmosphere for some time, the flare-induced ozone thinning probably lasted for just four years, the researchers report. That is because the nitrogen oxides that cause the depletion eventually rain down with water or ice. Indeed, it was this acid rain that was eventually recorded in the ice cores. While this may be good for the ozone layer – acid rain can have harmful effects on plants, aquatic animals, and infrastructure. Intense solar flares release very-high-energy particles that can (in some cases) cause radiation poisoning to humans (and mammals in general) in the same way as low-energy radiation from nuclear blasts. Earth's atmosphere and magnetosphere allow adequate protection at ground level, however, there is concern that thinning of the ozone layer could let more of this harmful energy to reach earth. The penetration of high-energy particles into living cells can cause chromosome damage, skin cancer, and a host of other health problems. Large doses can be fatal immediately. Solar protons with energies greater than 30 MeV are particularly hazardous. Solar proton events can also produce elevated radiation aboard aircraft flying at high altitudes. Although these risks are small, monitoring of solar proton events by satellite instrumentation allows the occasional exposure to be monitored and evaluated, and eventually the flight paths and altitudes adjusted in order to lower the absorbed dose of the flight crews. [citation needed. Increased Human exposure to UV-B increases the risk of skin cancer, cataracts, and a suppressed immune system. Increased UV-B radiation directly affects the food chain, lower crop levels, and all life from humans and food on all levels even down to the lowest level of photo-plankton. Some people are concerned that a sever solar flare could cause reduced agricultural yields, which in turn could lead to famine in parts of the world. Some people even theorize that large flares can lead to mutation of bacteria, making them stronger, more resistant to antibiotics. Viruses are also mutating. This has already brought a worldwide increase in diseases that are increasingly difficult to treat with drugs. You probably know about the hole in the ozone, but do you know about the hole in the Magnetosphere? The area around the Earth that extends beyond the atmosphere is called the Magnetosphere. The Magnetosphere begins at approximately 1,000 km and extends thousands of kilometers into space. The sun and the Earth's magnetic field create this layer. The following is an artists rendition (source = Wikipedia: Magnetosphere). NASA has recently discovered that the earth’s magnetic field contains a hole, which is ten times larger than they previously believed. The magnetosphere shelters us from solar flares, but the hole is now four times the size of the earth. National Geographic magazine reported that scientists said, "An unexpected, thick layer of solar particles inside Earth's magnetic field suggests there are huge breaches in our planet's solar defenses." The article went on to say that during the next solar flares in 2012 these holes will be responsible for tremendous solar storms. David Sibeck, a space-weather expert at NASA said, "So if all of this is true, it should be that we're in for a tough time in the next 11 years." Most of the time, solar flares – like small earthquakes can shake your confidence, but not necessarily do a lot of damage. Occasionally, big events occur like the solar flare recorded on April 2, 2001, which had it hit us head on might have prevented Sept 11, 2001 (i.e., no planes flying). Just like big earthquakes – if it happens in front of you, it's going to be terrible. However, as the sun is a ball and the earth travels around the sun and takes up figuratively just a little space – the chances that a big solar flare will occur and hit the earth head on are quite small. While there are records of major solar flares in our past, there does not appear that it caused any insurmountable problems. The worst case scenario would happen when a violent CME that accompanies a solar flare would both come at us in a 1-2 punch during the suns peak activity cycle. Scientists are concerned that what is now the low sun spot activity cycle (40% higher than normal) might be 40% higher than normal at the peak activity level. But, worst of all what that might mean come 2012? Now that you know the facts. Check out this cool video.